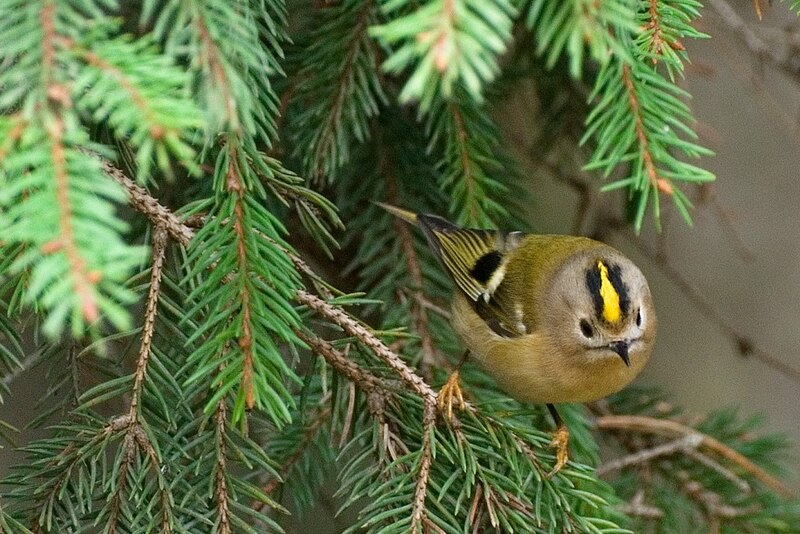 Goldcrest Regulus regulus, photographed by Rein Kuresoo. 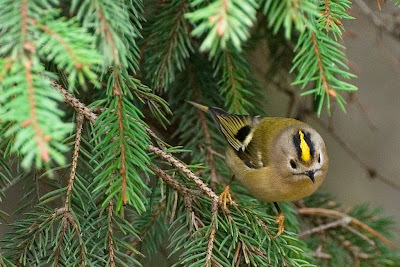 The genus Regulus contains the kinglets, very small birds of the Holarctic region. Both the generic and vernacular name refer to the crowns of yellow, orange or red the birds possess. Kinglets build bowl-shaped nests from moss and lichen bound with spider and caterpillar silk that expand as the young grow (Sturmbauer et al. 1998). Characters (from Sturmbauer et al. 1998): Small, fluffy-plumaged; wings with ten primaries. Nostrils basal, with oval opening in front of coriaceous groove, indistinctly operculated, usually covered with small, stiff, peculiarly-shaped feather (except in Regulus calendula).